so glad to be here...saves me a lot of time. and the ideas...ooohhh the ideas are just great! 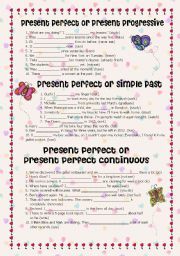 A 3 part exercise contrasting the use of present perfect versus simple past, present progressive and present perfect progressive/continuous. 3 ACTIVITIES on feelings and emotions. ANSWER KEY: 1. angry 2. worried 3. confused 4. bored 5. disgusted 6. sad 7. jealous 8. happy 9. scared 10. content 11. sorry 12. surprised 13. tired. CONVERSATION: SAD, TIRED, SORRY, SCARED, WORRY, SURPRISED. couldnt include the answer key in the ws cz it makes the file big. 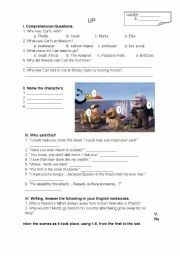 As my students enjoyed this movie, i made a worksheet to work with the movie "Up". 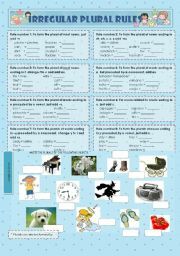 Comprehension questions, writing activity, listening and arranging tasks are in this worksheet. easy exercise on root words. wanted to update the title to ´Root Words´(not Rootwords) but the file became 297kb and it isnt accepted by the system. dont know why when the maximum is supposed to be 300kb. so i stuck to the old file. 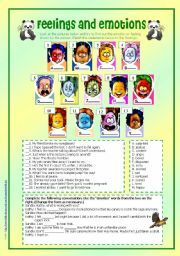 Rules on forming the plurals of irregular nouns with words to practice and a short exercise using pictures. Used ´God´s Gift of Language A´ as guide. 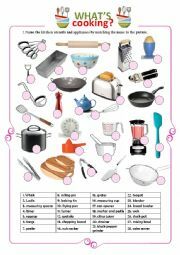 Present tense -Active and Passive Form (emphasis on passive) Phrasal verbs, pronouns, indirect objects - as used in the passive form. Teaching the present tense in both the active and passive form. More emphasis given on the passive, though. A guide of the forms is given plus 3 exercises on the form. 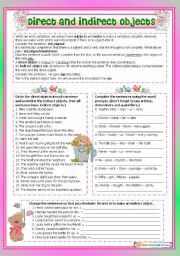 Also included are phrasal verbs, pronouns, indirect objects used in the passive form. 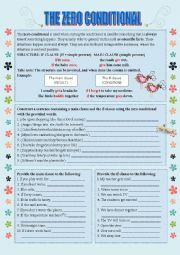 4 EXERCISES on practicing the use of objective pronouns. This is the lesson for my first week of classes. 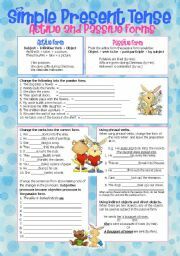 A worksheet of the same title is also available for download. powerpoint for capitalization rules with examples.